ST. AUGUSTINE, Fla., Aug. 30 /CSRwire/ - The Green Transition Scoreboard® tally jumped from $4.1 trillion reported in February to $5.2 trillion as of July 2013. The Green Transition Scoreboard® tracks private investments, since 2007, in creating cleaner, greener economies globally. Models show that investing at least $1 trillion per year until 2020 will lead from the fossil fueled industrial era to a technologically advanced solar age based on ethical principles of equity, efficiency, biomimicry and earth systems science. Hazel Henderson, president of Ethical Markets Media and creator of the Green Transition Scoreboard® (GTS), focuses research into substantial capital investments in Renewable Energy, Efficiency, Green Construction, Corporate R&D and Cleantech technologies based on her years of experience as a science advisor in Washington, DC. To date, investments are well on the way to the $10 trillion by 2020 mark. The mid-year Update to the Green Transition Inflection Point: Green Transition Scoreboard® 2013 Report provides a succinct summary of the GTS and delves into the trends growing the Renewable Energy and Green Construction sectors, specifically. The GTS is chronicling how investors and asset managers are updating strategic asset allocation models both as opportunities and as risk mitigation. GTS endorsers include Prof. Dan Kammen, UC Berkeley; Don Tapscott, author Wikinomics; Ashok Khosla, Development Alternatives, India; and many more. With $2.3 trillion privately invested globally since 2007 in Renewable Energy, the highest sector monitored by the Green Transition Scoreboard® is benefitting from reduced cost and greater efficiencies as well as from changing attitudes toward fossil fuels and diminished returns on investments. Green Construction is increasing as the demolition subsector takes down outdated infrastructure. The Efficiency sector is adding material and water efficiencies to the energy efficiencies boosting this sector. 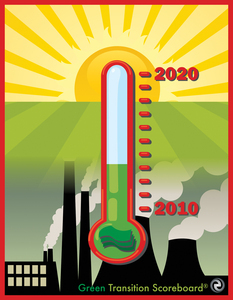 “In light of climate change,” says Henderson, “I agree with Storebrand’s position.” Christine Tørklep Meisingset, Head of Sustainable Investments for Storebrand, a major Norwegian pension fund advisor, told Henderson that Storebrand needed to adjust its investment strategy to reduce exposure to unburnable and, thus, increasingly diminished value fossil fuels. Timothy Jack Nash, Director of Sustainability Research for Ethical Markets Media, is excited to have unearthed many buried investments in green sectors. “A large portion of this mid-year jump is due to better reporting, by market research organizations and companies themselves, of green activities and initiatives,” says Nash. “Beyond this inflection point, clean technology investment, integral to the green economy, is inevitably growing toward the Solar Age, based on Earth Systems Science, Hazel Henderson has been forecasting,” says Rosalinda Sanquiche, executive director of Ethical Markets and co-author and researcher of the GTS.